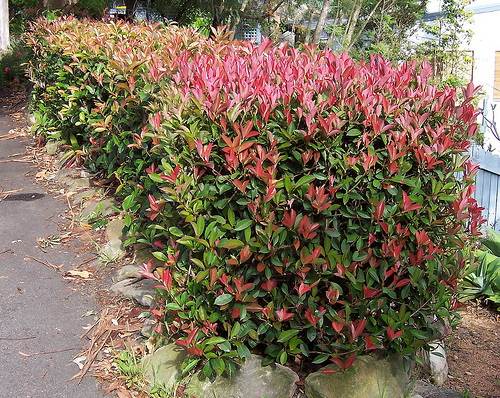 Like most garden art traditions the ‘hedging concept’ is imported to Australia from the northern hemisphere. 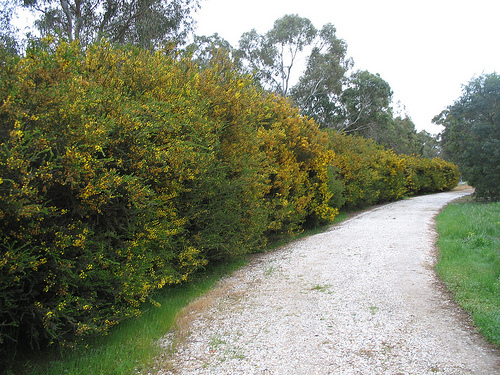 An Australian native hedge tends to be more unruly or woodier when compared to the neat clipped hedges of the boxes found in the Royal Palaces of England. Of course there are a few aust. native species that will produce a similar appearance – but not many. Nonetheless if you commit to a ‘tidy’ hedge in your garden you will probably need to commit to a long term maintenance program of clipping . If you are keen designer an overgrown hedge should really be a deliberate gesture – not a result of poor landscape management. If you went to the trouble of installing plants at your proposed spacings to obtain a uniform appearance you need to follow through with your clippers on a regular basis. Following a visit to Versailles a friend’s of mine installed approx. 9 Eucalyptus polyanthums in the front garden of a smallish residential property in French Avenue in Australia (strange?). The design intent was to keep the trees neatly pruned. These trees are HUGE, can be fast growing and have a very open habit if left to their own devices. I just popped into google earth to see how it was looking for this article (approximately 6 years after installing). Oh, the owner went travelling and no-one is hedging them. Eeek. Guess what? The house now sits at the base of an overgrown woodland. Its all out of proportion. Maintenance is key to the success of garden design. Its an issue that is particularly challenging when the design includes tall hedges (this can also be a problem for green walls but that is another article). I did a quick search on possible solutions for gaining access to tall trees or hedges and I found a UK company (Henchman’s) that has designed and manfactuered a hedge cutting platform. It is used by an impressive list of UK hedge owners – the Queen, National Trust and the Eden Project to name a few. Henchman’s pioneered the safe hedge cutting platform in 1994. The platform allows each leg to be altered to accommodate uneven land – plus allows hands to be free – check out the website for further details http://www.henchman.co.uk/solutioncategory.jsf?id=1. The hedge cutter below is NOT using a Henchman platform. Next articleHow do you mow grass when it is on the wall? Maintenance issues for green walls and balls. The best way to get your lawn mown. Get a lawn mower man called Mark.